The Celebration of Whimsy, 21A Clinton Street, Lower East Side. 9pm; $12. More info here. All good things must come to an end, even this wonderfully weird variety show that tries valiantly every month to retain the spirit of what the LES performance scene used to be. To go out with a proper bang, the folks at Surf Reality have prepared a nice long lineup of guests such as burlesque performers Little Brooklyn and Velocity Chyaldd in addition to their roster of regulars like comedic musician Jessica Delfino, downtown performance veteran Faceboy, performance artist Fritz Donnelly, and two sketch and improv duos. Though it’s their last show, it certainly won’t be a brief affair. Continues through December 6 at Cloud City, 85 N 1st Street, Williamsburg. 8pm (Sunday shows at 5pm); $15-25 sliding scale. More info here. 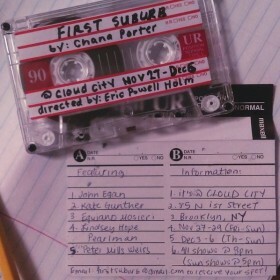 Take a trip out of the city and back into the ’90s with this play at cozy Williamsburg art space Cloud City (you’ll recall their photography show of DIY venue pix). It’s written by Chana Porter, a playwright and science fiction novelist who has shown theatrical work at Dixon Place, PS122, Invisible Dog, and Movement Research, and directed by Eric Powell Holm. We don’t know much about this play, but we do know there will be flannel. at Over the Eight, 594 Union Ave, Williamsburg. 8pm; free. More info here. Comedian Edy Modica, part of the team behind the zany naked alien comedy show titled Body, hosts a night of more traditional stand-up at Williamsburg comedy fixture Over the Eight, featuring a hearty bunch of funny folk. Watch Jo Firestone, Lorelei Ramirez, Joel Kim Booster, and more sling jokes throughout the night. But this isn’t just your average night of amusements: performers will be competing for the biggest prize of all, the approval of Modica’s parents. They will, of course, be making a special appearance. Continues through January 3 at Abrons Arts Center, 466 Grand Street, Lower East Side. Tickets are $49-69. More info here. Maybe you did this musical in high school. I know I did. But here, you can see it in a whole new (and hopefully better quality) light. The story of a prince who tries to find a princess and (to his delight) finds one who is not exactly the picture perfect ideal of regal femininity will hopefully be taken out of the past and refreshed by Transport Group, a company who specializes in staging imaginative revivals of classic American works. 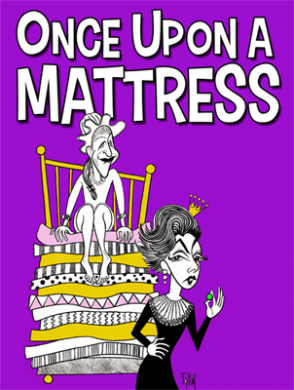 The cast is fronted by comedian and veteran actress Jackie Hoffman and drag performer Lypsinka. Continues through December 20 at The Flea Theater, 41 White Street, Tribeca. 7pm; tickets are $35-75 and can be purchased here. Thursdays, tickets are are pay-what-you-can. More info here. 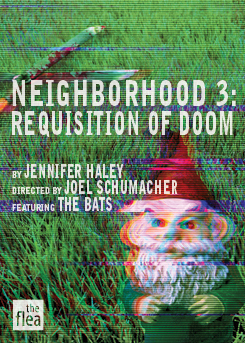 Jennifer Haley’s new play (cheekily hashtagged “#N3RD”) centers around the odd suburban phenomenon of cul-de-sacs and the Neighborhood Associations that govern them. Only this time, there’s a wildly-popular zombie video game involved, which uses GPS tracking to allow teens to battle zombies in their own neighborhood. Sure sounds like nothing will go wrong there! The piece is directed by Joel Schumacher—known for directing The Lost Boys and Batman And Robin—and features The Flea’s bright young acting ensemble, The Bats. The theater will also be partnering with live action game Humans Vs Zombies, which will be presenting a new version of the game inspired by the play.